The Nabtesco Group has long been creating new markets, developing products and ensuring the safety of our products with our customers, who have a trustworthy relationships with us. Besides achieving “safety, comfort and a sense of security” of products, we also ensure them for customers who purchase our products as well as for end users by collecting and analyzing information on the actual conditions and environment in which products are used. We then utilize and reflect the gathered information in manufacturing our products to achieve the safety, reliability, and stability requirements, as well as the high functionality and performance necessary for realizing maximum comfort. As a result, we have received positive evaluations from corporate customers demanding high technology in various fields and can now offer products and services—many of which take top spots in their respective markets. In the future, we will continue striving to ensure safety, comfort and a sense of security, with high value based on our unique motion control technology, throughout the life cycles of our products. The Nabtesco Group, as a provider of high level of products for a wide range of fields and markets, recognizes that one of our material CSR issues (materiality) is to provide customers with products with safety, comfort and a sense of security which are all outcomes from functionality and performance of products. With this understanding, the Nabtesco Group has established the Nabtesco Group Quality & PL Policy. Realize product quality, which satisfies market demand, by conducting safety and other quality evaluations prior to the release of products to the market. 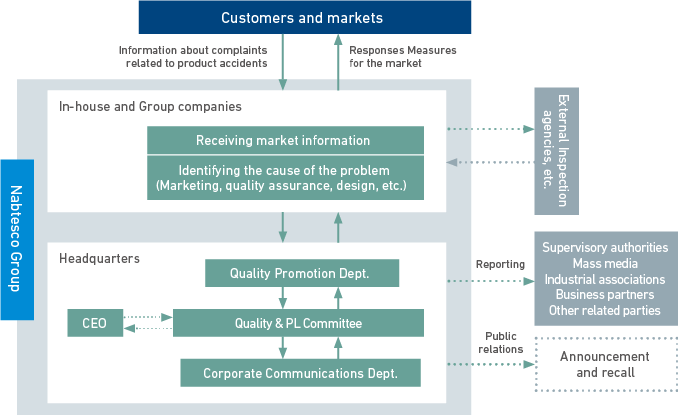 The Quality & PL Committee promotes manufacturing procedures, which incorporate quality engineering, quality control and PL management processes (including those for product safety management) through listening to the opinions of customers and end users to meet the ever changing needs of society. Nabtesco Group holds annual meetings of the Quality & PL Committee to decide on activity policies for the coming year by identifying what problems and issues have arisen in the Group. Based on these policies, our in-house companies conduct specific activities as a part of their daily operations. However, since each in-house company deals with different products and customers, it is difficult to audit the activities of all of our in-house companies according to the common rules and criteria. Therefore, we regularly hold meetings with each individual in-house company to better understand their unique situations, to give tailor-made advice and to consider what kind of support we can offer in order to make improvements and to implement more effective Quality and PL measures. The Quality & PL Committee has been established within the company (Secretariat: Quality Promotion Department). The objective of the committee is to formulate the criteria for quality control and product liability and safety management at the Nabtesco Group, to establish standard processes to prevent any instances of inferior quality, such as safety-related defects, and to respond appropriately to any quality or product liability problem should it occur, so as to maintain and improve the quality and safety of products. The committee contributes to the Group’s sustainable growth through building trust with our customers. According to the operating rules, the committee also reviews activities implemented throughout the Group in the previous fiscal year, discusses matters such as annual policies, and main issues to be tackled in the upcoming year, which will be promoted through all in-house companies after approved. In recent years, upholding the basic policy of enhancing fundamentals of design and manufacturing quality, we have been working on the intensive training of new employees on quality basics as well as provision f instructions to our overseas bases and suppliers for the improvement of 5S (workplace safety activities) and also establishment of necessary processes at their sites. Since FY2015, we have been holding meetings at each site that give participating employees opportunities to ask “why” and “how” questions that arise from their daily operations, as part of “Know-why Nabtesco activities.” These meetings are expected to have positive impacts on operation quality and technology inheritance though higher common awareness at their worksites. In result of the continued efforts over the long period of time, losses caused by quality defects have steadily been decreasing, and our foundation for the provision of customer safety, comfort and security have strengthened. We have various product lineups such as aircraft flight control actuation systems, brake components for railroad vehicles, remote control systems for marine vessels, platform doors for railroad stations and automatic doors for buildings. Due to the very nature of these products, they could pose serious risks to human life in the event of a malfunction-related worst case scenario. Based on this recognition, we have a complete support system to enable us to respond appropriately to any contingency. In particular, with customers who use our component products, we foster close communications and cooperation to ensure the quality and safety of their products and thus prevent any product-related accidents. Consequently, we have gained a high rating over the reliability of products. We also provide a consultation service about our products 24 hours a day through the website. Until the present moment since the foundation of Nabtesco, we have not had any major casualty incidents incurred by the use of our products (product liability). All the production bases of Nabtesco Corporation as well as major Nabtesco Group companies in Japan and major overseas Group companies have obtained certification for their quality management system according to the corresponding local industrial standards. In terms of the amount of sales, over 90% of the Group’s products are manufactured under certified quality management systems. Today, the numbers of certifications obtained amount to 19 in Japan and 16 overseas including those based on the industry specific standards. We regularly provide opportunities for persons in charge of quality from different in-house companies to share knowledge and experiences peculiar to their industries and to discuss ways to improve quality. From the start of the 2010s, the Nabtesco Group has increased the number of production sites to develop a superior and more flexible product supply system for overseas customers. At the new sites, we have been building trust in the local community based on mutual understanding with local employees and staff. For quality, the Quality Assurance Department in each in-house company responsible for each business gives guidance mainly on practical operations, such as improving each process and evaluation. The Quality Promotion Department of the Technology and R&D Division at the Headquarters provides guidance or education and conducts audits considering social demands to convey what actions should be taken on site and what should be observed, in addition to the theories of quality management methods. Based on the Japanese-style manufacturing, we will improve quality based on local market needs. In quality activities during 2017, a change in operating policy following the replacement of an expatriate caused anxiety, complaints, and confusion among local employees. To prevent harmful repercussions for quality and business activities, we provided this expatriate with training on multicultural communication. In the future, we will instill Nabtesco’s quality management in local managers for long-term quality stability.